Return-based style analysis (RBSA) draws from Bill Sharpe’s style analysis model, which stipulates that a manager’s investment style can be determined by comparing the returns on a portfolio with those of a certain number of selected indices. Through quadratic optimization modeling, RBSA is an effective way to test whether a fund maintains its professed style mandate. RBSA examines a fund’s style over a period of time and tells how the portfolio’s returns behave, rather than the stocks the portfolio is actually holding (holding-based). Holding-based style analysis (HBSA), by contrast, analyzes each of the securities that make up the portfolio. The securities are studied and ranked according to different characteristics that allow their style to be described. The results are aggregated at the portfolio level to obtain the style of the entire portfolio. Where RBSA is typically applied over a specified period, HBSA is typically conducted at a single point in time. •	RBSA is easier to conduct: All that is needed is the portfolio’s return stream and a representative set of indices for analysis. •	Period of time vs. snapshot: RBSA looks at the portfolio over a period of time. Holding-based is a snapshot of a single point in time. •	Better predictor: If the aim is to predict a fund’s future returns (in a certain style), factor exposures seem to be more relevant than actual portfolio holdings. This reasoning gives advantage to RBSA. Overall, we believe that HBSA is a more tedious and time-consuming approach. 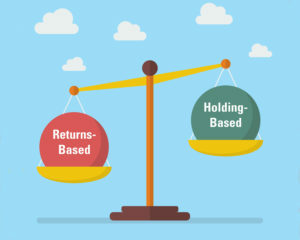 Holding-based is more of an accounting-driven approach, which stresses characteristics and categorization, rather than return behavior. Plan-Level Rate of Return—Useful or Useless? Target Date Funds—Does One Size Really Fit All?